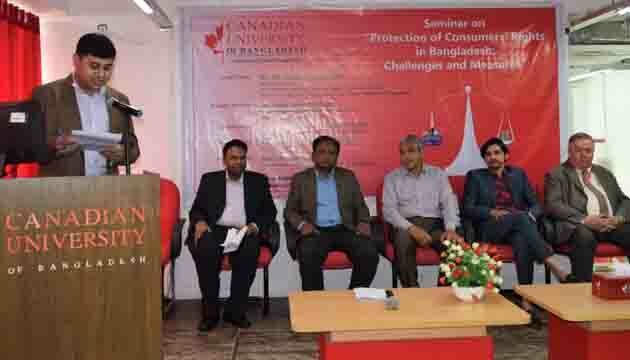 Canadian University of Bangladesh arranged a seminar on ‘Protection of Consumers Right in Bangladesh: Challenges and Measures’ on 19 March 2019 (Tuesday) at the University Auditorium. Md. 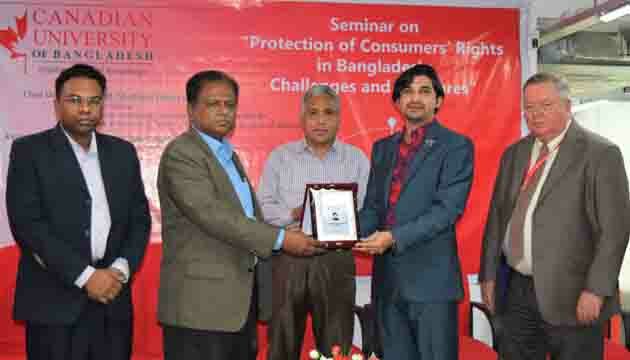 Shafiqul Islam Laskar, Director General, Directorate of National Consumer Rights Protection (DNCRP), Ministry of Commerce, People’s Republic of Bangladesh was the Chief Guest in the seminar. 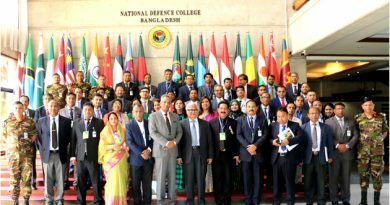 Prof. Dr. Muhammad Mahfuzul Islam, Vice Chancellor, Canadian University of Bangladesh and Mr. Rashadul Hossain Chowdhury, Director, FBCCl graced the occasion as Special Guests. Professor William H Derrenger, Dean, School of Business gave the welcome speech in the seminar. Prof. Dr. Nazrul Islam, Pro Vice Chancellor of Canadian University of Bangladesh Chaired the programme. 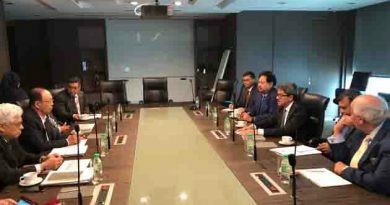 Along with others, Dr. MD Shahrukh Adnan Khan, Dean (Acting), School of Science & Engineering and Head, Department of EEE, Mr. S. M. Arifuzzaman, Head, School of Business, Dr. Abdullah-Al-Monzur Hussain, Head, School of Law, Dr. Nurul Islam Babul, Head, Department of Film & TV, Capt Kazi Ali Imam, Head. Department of Shipping & Maritime Science (SMS), Dr. M Mamoon Al Bashir, Academic Director, MBA & EMBA Programs, Mr. Md. Latiful Khabir, Assistant Professor, School of Business and Head of Student Service Wing & Students’ Directorate, Dr. Akim M Rahman, Assistant Professor, School of Business and more than 100 students of CUB attended the seminar.